7Seas Fishing Game • Weeklong Fishing Contest (Unbaited / Sunday 12 am SLT) - KABALYERO - PLAY, BLOG & EARN! I started fishing with 7Seas Fishing Game many years ago but I stopped because I became too busy with other things but, today at my place in Second Life, I placed a 7Seas Fishing Server, a 7Seas Custom Prize Giver with a few prizes and setup a 7Seas Fishing Game Weeklong Fishing Contest. My 7Seas Fishing Game Weeklong Fishing Contest will start this Sunday at 12 am, it's a Non Baited Fishing Contest which means Bait is not required to fish and it will run for 7 days. Currently, the Prize Pot has a total prize of 200 Linden Dollars but donations to increase the Prize Pot are welcome. Since my 7Seas Fishing Game Weeklong Fishing Contest is a Non Baited Fishing Contest, this contest is open to both Casual and Pro Fishing Rod users. If you're interested in joining my 7Seas Fishing Game Weeklong Fishing Contest but you don't have either a Casual or Pro Fishing Rod then you can buy one of them from the 7Seas Fishing Game Gear Vendor located at place or from any 7Seas Fishing Game Fishing Areas. 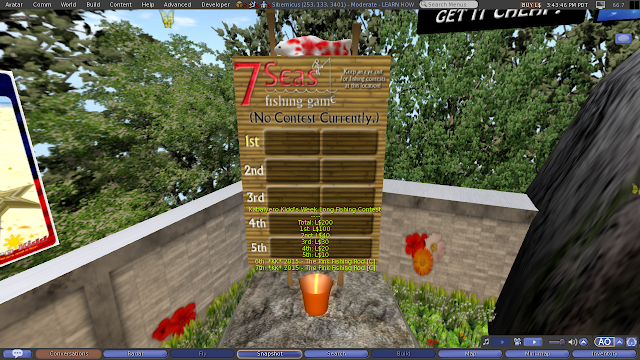 So guys, if have some free time in Second Life and you own either a Casual or Pro 7Seas Fishing Game Fishing Rod then drop by my place in-world and put your names on the 7Seas Fishing Game Contest Board. Again, my 7Seas Fishing Game Weeklong Fishing Contest is a Non Baited Fishing Contest and it will start this Sunday at 12 am SLT or Second Life Time. The link to my place in Second Life is in the description of this video.